Nose (87): inexistent. honey, citrus, salt, herbs, smoke. Palate (88): powerful, oily. honey, peat, vanilla, spices, citrus, floral. So based on other whiskies I have already tasted I rate this Bowmore Small Batch Reserve Islay Single Malt Scotch Whisky with 88 points over 100. A combination of flavours from vanilla-rich bourbon casks and two years in Oloroso sherry casks. Tastes like Pedro Ximinez sherry drizzled on good vanilla ice cream. Nose (90): more than average. honey, nuts, cinnamon, vanilla, salt, citrus, smoke. Palate (89): powerful, oily. honey, wood, citrus, nuts, leather, cocoa, vanilla, treacle, salt. Finish (89): longer than average. honey, spices, cocoa. So based on other whiskies I have already tasted I rate this Bowmore 15 year Darkest with 89 points over 100. I am no expert in chocolate ( like if I am one in whisky! ) 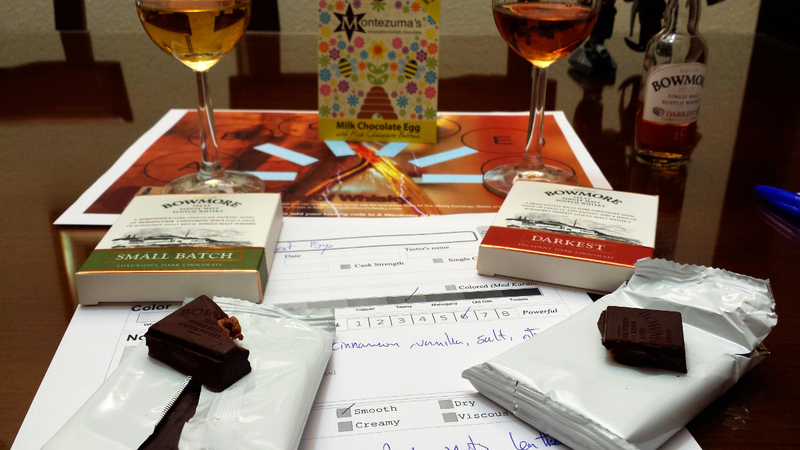 but I really love chocolate ( even more than I love whisky ) so after tasting both chocolates and gorgeous Easter egg first thing I did was checking if Montezuma’s deliver to Spain :D.
The Small Batch chocolate is delicious with notes of honey sweetness and salt. Have you tasted Lindt with salt crystals? Well, like that but well done… really delicious. When you pair it with the Small Batch whisky it really made the citrus and complex spicy character of Small batch shine. It is a great experience. The Darkest chocolate has more whisky influence than the Small Batch, here there is a torrent of flavours of cinnamon, raisins and sherry wood. It is marvellous. When you pair it with the whisky, it really explodes the sherry character of the malt. If the Small batch was a great experience, this is a must-taste. 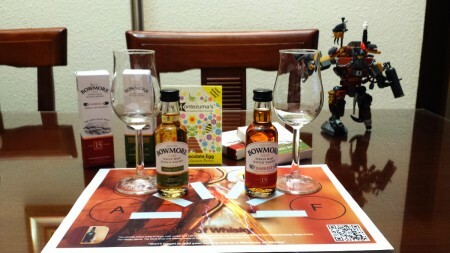 Both chocolates are limited editions created by Bowmore and Montezuma’s. So hurry up if you want to try them. Lovely experience. You can taste them on the “Taste of Islay” events running throughout Europe in 2014 and in the distillery ( a new excuse to visit Bowmore at Islay ).